Have you ever wondered what’s the secret to a long life? It’s more than eating healthy foods and exercising your body. It’s the same factor that helped Adam, Noah, Abraham, Isaac, Jacob, Moses and many of the Old Testament patriarch’s live long and fruitful lives. It’s the same factor that will help you too. I recently did some research on the men that encouraged and mentored me in my career as an artist. I came across the online biography of one of these men. He was an older Jewish man who took the time to freely invite me over to his house once a month, to teach me how to develop my artistic skills. He and his wife were always very kind to me and I learned quite a lot from his professional advice. Mr. Weiss was a busy and successful syndicated cartoonist who also had a mentally challenged autistic son to cope with. Yet despite his busy schedule and demanding family life, he always made time to help me when he could. Many years have passed now and I feel such gratitude for this man for his generosity. I found out in his biography that he lived to the ripe old age of 98 years old! It was no coincidence that he lived a long life. I’m sure it was God’s blessing, among other reasons, for having such a compassionate and giving heart. You see, when we love and honor God by our actions, that is, by reflecting His heart of love and compassion for others, our LORD takes into account our righteous deeds. He smiles down upon us from heaven and rewards us in many ways. One such reward is the blessing of long life. In Jewish tradition, length of days has always been considered to be the blessing for living a righteous life and honoring God. Living a long and fruitful life is what God desires for us all. Sadly, many people choose to ignore this fact and do not alter their self-destructive ways. They ignore God’s guidance and bring upon themselves trouble, unhappiness, sickness, pain, and premature death. It was never God’s intention that they experience such calamities, but it was their own wrong choices in life that brought about these consequences. When God created our first parents, Adam and Eve, He created mankind to live forever in paradise. 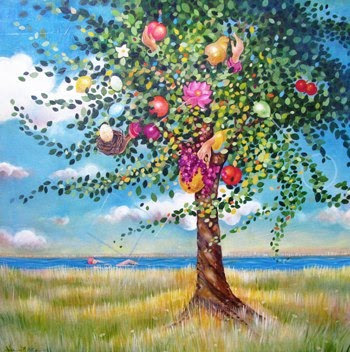 He planted them in the garden of Eden, where there was peace, happiness, bountiful food, health, and every need was taken care of. God Himself met with them in the cool of the afternoon* (Genesis 3:8). Unfortunately, instead of trusting in God’s direction, they heeded the lies of Satan and ate of the forbidden fruit. As a result, sin and death entered into the world. They not only brought judgment upon themselves, but on the rest of mankind ever since. Only Jesus can rescue us from this curse. Despite their disobedience, God had mercy upon them and provided a way to redeem them and their descendents from the consequences of sin and death. Through faith in the vicarious sacrifice of Jesus the Messiah on the cross, we were freed from this curse. Jesus took the curse upon Himself for us and freed us to be happy and blessed once again. The day we invited Jesus to be our Savior and Lord, the curse of unhappiness, sickness, pain, and death was broken over our lives and now we can expect to live long and fruitful lives upon the earth. But let us never forget where we came from. We must use this second chance of new life in Christ to avoid making the mistakes and poor choices of the past. By the grace of God we have been forgiven and set free of the old self and have put on the new self in Messiah Jesus. We have a new opportunity to fulfill the good plans God originally purposed for our lives. As we endeavor to live according to God’s ways and pursue righteousness, God will satisfy us, among other things, with long and fruitful lives. We may not live to be 175 years old like Abraham, but we can expect to live to a ripe old age, full of peace, joy, and good health. We will enjoy the fruits of our labor to the fullest. We are blessed with faithful Abraham. As with Abraham – the father of our faith, we can expect God to bless our lives in every way and to finally die one day of “a good old age, an old man (or woman), and full of years” (Genesis 25:8). The Scriptures also tell us that Abraham was “gathered to his people.” This Old Testament expression signifies more than his burial. It refers to a life well lived and the expectation of being reunited with our loved ones after death. Jesus, along with our departed family and friends in Messiah will be there to meet us upon our resurrection. He will welcome us and say, “Well done, my good and faithful servant; enter into the joy of the Lord” (Matthew 25:21). * The natural connotation of Genesis 3:8 is that God was in the habit of meeting with Adam and Eve in the Garden of Eden each afternoon. Before they sinned, this passage suggests closeness and intimacy and fellowship with God. Although this was not the first time Adam and Eve heard God’s voice in the garden, this was the first time they hid themselves for fear of the sin they had committed. Categories: God's Blessing of Long Life, Spirit Lifting Thoughts for Today | Tags: 3:13, Blessings of long life, Curse, Fruitfulness, Galatians 3:7-9, Genesis 1:28, Happiness, Health, Living Righteous, Making Good Choices, Matthew 25:21, New Life in Jesus, Obeying God’s Guidance, Old Age, Peace, Poor Choices, Premature Death, Prosperity, Redemption in Christ, Sickness, Sin | Permalink. Blessed are you when others revile you, reproach you, falsely accuse you and call you by evil and contemptuous names. They said the same of Jesus – that he was a Samaritan and had a devil (John 8:48); that he was mad (John 10:20); and they even reviled and mocked him while dying on the cross (Matthew 27:39-44). Sometimes people may accuse you falsely of all manner of evil in order to slander your good name. But don’t fret about this. There is great blessing ahead for you if you bear it patiently. Remember, that although reviled, Jesus reviled not back. When we suffer unwarranted persecution we should follow in the footsteps of Jesus, to imitate his example, and even to suffer for his sake (Philippians 1:29). The godly can look forward to a reward, while the wicked can expect only judgment (Proverbs 11:23). There are times, not only in our darkest hour, when we find it hard to pray as we ought. At times He seems so far away. But, God calls us to give him thanks in all situations; to praise him for who He is; and to sing of his glory. He calls us to rejoice in Him always. and there will be no bud on the vines. and the farmland will produce no food. and there will be no herd at the manger. and I will exult in the God of my salvation. And he will set my feet like those of the deer. Categories: Spirit Lifting Thoughts for Today | Tags: Christian Persecution, False Accusations, Following in Jesus Footseteps, Insults, John 10:20, John 8:48, Judgment of evildoers, Matthew 27:39-44, Matthew 5:11-23, Name Calling, Patience, Philippians 1:29, Proverbs 11:23, Reproach, Slander, Suffering for Christ | Permalink. Most mornings after I pray and have a cup of coffee, I log-on to my laptop computer and check my email messages. I start hitting the “Delete” button, trying to clean-out the dozens of messages I don’t have the time, or desire to read. Messages like those from scam ministries asking for money, or advertisers attempting to sell me cheap watches or fabulous vacations in Tobingo – all kinds of “Junk Email” that clutters my email box every day. 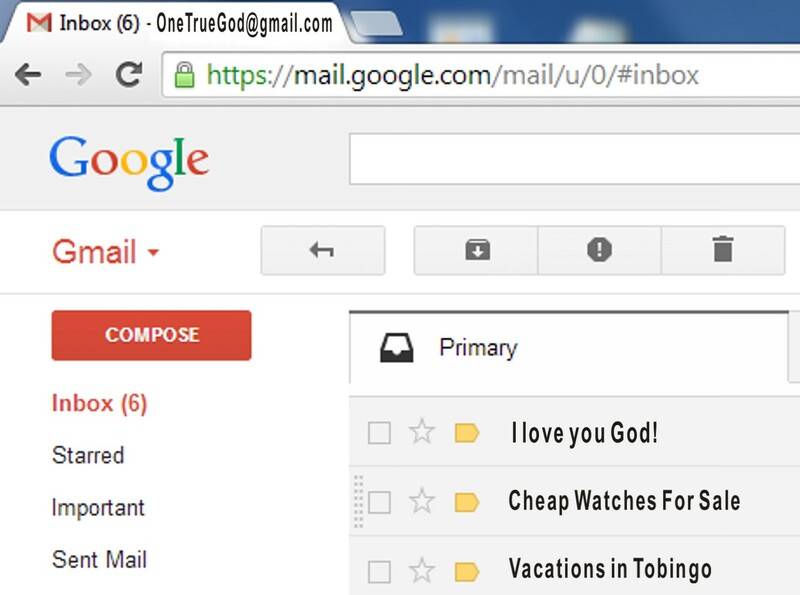 Recently, I wondered how God handles all the email He gets. If He had an email address, that is, it might be something like: “OneTrueGod@gmail.com.” Would He read every email He received? Or, would He delete many of them without opening, like I do? Actually, I believe He would read every single one! Here’s why: I believe our God loves to hear from us anytime we want to talk with Him. And He doesn’t get bored with us like other people do. He enjoys every conversation we have with Him. He is never too busy to listen to us when we visit with Him in prayer. In fact, He tells us to pray unceasingly. God loves us so much that when we honestly let him know about what’s going on in our lives – our needs, feelings, hurts, and even complaints, we always have His full attention. God is the most compassionate and best friend we will ever have. We can talk to Him about anything. He will never be judgmental or criticize us for what we say, or for expressing our feelings no matter how dumb. He has promised to “be there” for us any time of the day or night, twenty four hours a day, seven days a week. So next time you need to talk with someone, talk with God first. Prayer is the best (IM) Instant Messenger – better than chatting on Google or Facebook. You can chat with God without needing a computer or Internet service. He is always ready to listen, and your message will never be deleted from His In-Box. Heavenly Father, I thank You for your unfailing love and concern for me. I thank You that I can come to You in prayer with all my needs, feelings, hurts, and complaints, 24/7. You will always be glad to hear from me. And as I cast all my cares upon You, You will care for me, understand me, and give me the right advice. I can always come before Your throne room of grace and receive mercy and compassion in my time of need. I bless You and praise You today. In Jesus’ name I pray, amen. Proclaiming the good news gospel of Jesus the Messiah to all nations. Categories: Spirit Lifting Thoughts for Today | Tags: 1 Peter 5:7., care, Chat, Compassion, Complaints, Email, Facebook, Feelings, God, Google Gmail, Hebrews 4:16, Holy Spirit, Hurts, IM, In-Box, Instant Messenger, Jesus Christ, John 6:37, Laptop Computer, Messiah, Needs, PRAYER, Understanding, Yeshua | Permalink. The events described by the apostle Paul in these verses is the Second Coming of Jesus Christ and the Rapture of the Church. When Jesus died on the cross, rose again, and ascended into heaven to be with God the Father, He told His disciples that, one day, He would return again. Therefore, we believe His promise and eagerly await His second coming, the rapture of His Bride (the faithful in His church), and the establishment of His millennial kingdom on the earth. The word RAPTURE comes from the Greek word harpazo, which translates into a “catching away” of believers. The moment Jesus returns everyone will know; every eye will see Him coming in the sky. Some will be glad to see Him, while others will be afraid for their time of judgment has come. His mighty voice will shout from the heavens and the angels will blow their great trumpets. The dead in Christ will be resurrected from their graves first, and then those of us who are still alive and remain will be instantly be given immortal bodies to fly up to meet the Lord in the air, which is the atmosphere between heaven and earth. Halleluyah! Because no one knows the day or the hours of Jesus’ return, we need to be ready at all times by watching and living sanctified lives. Those who don’t have a saving knowledge of Jesus Christ, or have not prepared their lamps with oil (like the five foolish virgins*) , will be left behind to experience the Great Tribulation, wrath of God He is sending upon the wicked of this earth. If the Lord Jesus comes back today, will you be ready? If not, repent of your sinful ways and invite Jesus to become your Savior and Lord of your life. Amen. 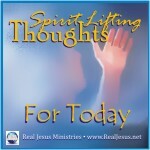 Categories: Spirit Lifting Thoughts for Today | Tags: 1 Thessalonians 4:16-18; 5:2, Bride, Catching Away, Church, Foolish Virgins, God, Great Tribulation, Jesus Christ, Lion of the Tribe of Judah, Matthew 25:1-13, Rapture, Resurrection of the dead, Return, Second Coming of Christ, Son of David, Son of God, Wrath of God, Yeshua | Permalink. In the fourth year of his reign, King Solomon began to build the temple of God in Jerusalem. The Bible tells us that Hiram, king of the Sidonians made a treaty of friendship with Solomon and graciously provided him with the best cedar and cypress lumber from his land for which to build God’s temple. He even went as far as to provide some of his most skilled craftsmen for hire to complete the job. Why would a heathen king do this? He wasn’t a follower of Yahovah God. In fact, the Sidonians worshipped a plethora of false gods. So why did he generously and enthusiastically provide the help Solomon needed to build God’s temple? Because God moved on his heart and gave Solomon favor with him. Without the help of these non-believers, God’s temple might not have been finished in time. This is a good example of how the LORD can also give us favor when we are doing His will for our lives. His Spirit will move upon people’s hearts to help us, and bless us in many ways. He will give us favor with our bosses at work, with our neighbors at home, with our friends and family, and even other people we come in contact with, that might be beneficial in supporting our lives and ministries. When we are doing the work of God, we won’t have to constantly beg for money or try to manipulate people like so many preachers do today. God knows our needs and He will provide the finances and help we need. We just need to pray, “Lord, You know we are doing this work for Your kingdom. You know what our needs are to accomplish this. We pray that you give us favor with others and move on their hearts to help us.” Then, after we’ve prayed, we rest and trust in His provision. Watch God move heaven and earth, if necessary, to make sure our needs are provided for. He will do great and mighty things if we trust Him to provide the resources to accomplish the work He has called us to do. Solomon completed the building of God’s temple in record time because he had God’s favor. The Jerusalem temple turned out to be so beautiful and glorious that kings and queens from all over the world came to see it, and God was glorified. Whatever God calls you to do, do it with all your heart. Pray and He will give you favor – sometimes, even with unbelievers, to help you finish the work He has purposed for your life and ministry. Pray and present your needs to Him. Trust God to provide for you in His timing. Don’t try to make things happen in your own strength, but wait upon the LORD to do what is best. Amen. Categories: Spirit Lifting Thoughts for Today | Tags: 1 Kings 5:10, Blessing, Favor, God, Hiram, Jehova, Jesus Christ, Messiah, Sidonians, Solomon's Temple, Tyre, Will of God, Yahova, Yeshua | Permalink.